A Wildchild Archery party gives budding archers the opportunity to learn some impressive new skills, enjoying fun games and practice sessions before competing in a Wildchild archery tournament with their friends. Fictional heroes from Robin Hood to Katniss Everdeen and Legolas make archery look so cool that kids just love the opportunity to pick up their own moves with a Wild Archery Birthday Party. 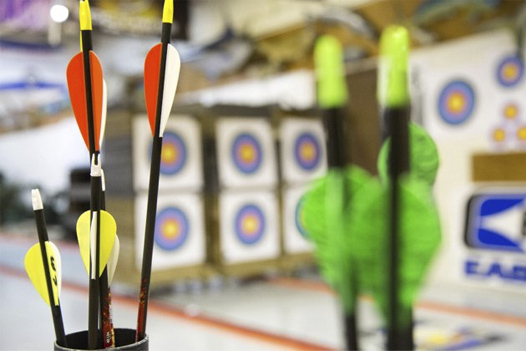 Using professional equipment, our trained instructors will provide an introduction to safety and shooting etiquette and technique, so children can confidently shoot their own arrows and go for gold! After lots of fun archery birthday party games, our Archery Party finale will be our Wildchild Tournament, where there’s honour at stake for the coveted title of top archer! Our Wild Archery birthday parties offer a fun and active way to celebrate, whilst teaching children a new skill that could lead to a cool new hobby! Choose from indoor or outdoor party (see venue options below). Location (indoors/outdoors): Outdoor parties are held at Phasels Wood Activity Centre, Kings Langley (two hours of activity – Archery and choice of one other – see Wild Code Action party for full details). Indoor parties are held in Harpenden. Our archery birthday parties are also mobile, depending on suitability of your venue – see list of suggested venues. Price: £249.00: Up to 12 children. Extra party guests £15.00 (can be confirmed and paid for 1 week before party date). What’s included: Venue hire, activities, qualified instruction. Food is not included. However, we do provide indoor seating area, drinks and a Wildchild party host to assist and clear area. We recommend that you provide basic party food (e.g sandwich, crisps and biscuit) as we only allow 20-25 minutes for food. Drinks and cups are provided. “Thanks very much for organising our Archery party at such short notice. All the children had a wonderful time and said it was the best party ever – high praise indeed”! “I wanted to say (in Finlay’s words) “Thank you for the brilliant party, you did a magnificant job.” It was really well organised and the smoothest run party Finlay’s ever had. This equalled less stress for us and more fun for Finlay”.